Drone technology, advanced sensor technology, Big Data, and artificial intelligence bear the promise of significant improvement opportunities for utilities. 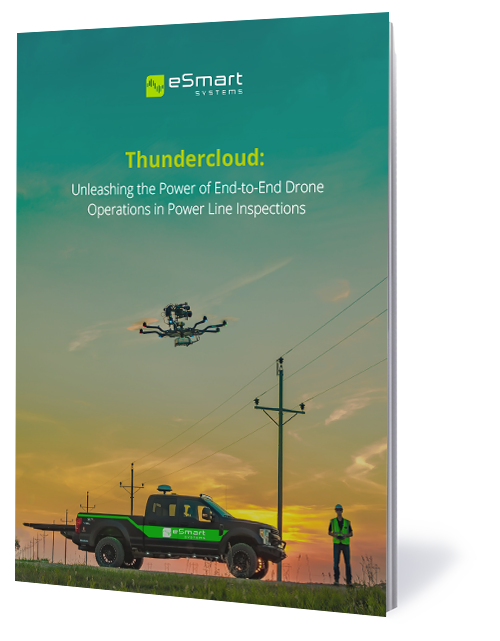 In this 11 page long e-book we'll walk you through how drone technology may combat inefficiencies, improve safety, and become a powerful assistant for utility line workers. We also discuss what technologies and strategies are needed to unlock the benefits, before revealing how the eSmart Systems Thundercloud toolset leverages intelligent Asset Performance Management (iAPM), mobile field support, and smart drones to help utilities reduce outage costs and radically improve existing power line inspection methods.